Summer is a time for family fun and family gatherings. Every family has a few recipes that everyone looks forward to. Whether it’s your great aunt’s hand pinched pirohy’s or your uncle’s smoked brisket – these are the foods that come loaded with great taste and great memories. This post is about ways to preserve your family’s taste treasury. I’ll also share a bit about a big project I’ve been working on with my Indian cooking mentor – Noorbanu Nimji. Noorbanu is responsible for preserving not only her own family’s recipes but also – the recipes of a whole culture’s cuisine. Today I have the fun job of talking about ways to preserve recipes on CBC Radio One’s Alberta at Noon. I’m excited to take calls from all over Alberta and to hear people’s stories about their favourite recipes. I’ve been involved in an exceptional project dedicated to this very idea for almost a decade. 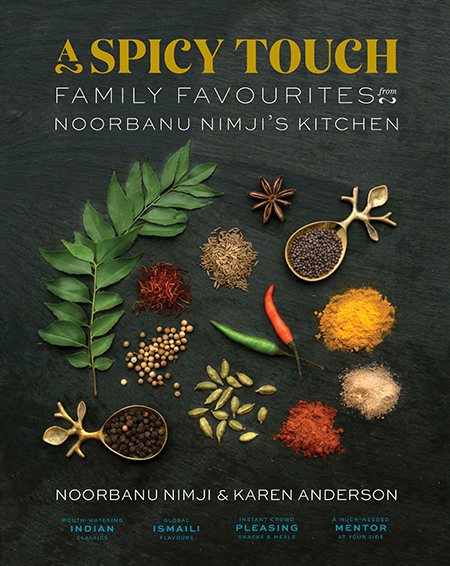 The project is a cookbook called A Spicy Touch – Family Favourites from Noorbanu Nimji’s Kitchen. Noorbanu Nimji and I have been working on this book – off and on as time, family and life have allowed – for nine years. I met Noorbanu in 1994 when I took an Indian cooking class from her. She has three previous A Spicy Touch cookbooks. The first came about because of Noorbanu’s work to preserve the recipes of her culture. She is an Ismaili Muslim from Kenya with ancestral roots in the Gujarat of North India. This Ismaili people were forced to leave their homes in East Africa in the early 1970s when then President Idi Amin was expelling non-Africans. Families were separated. Their delicious and unique food heritage was threatened and along with that an important cultural touchstone. Noorbanu is believed to be the first person in her culture to write down recipes that had previously only been transferred in oral tradition. She had the cooking skills and repertoire to do so and she did so with great success. She went on to sell over a quarter million copies of her first three books (over the last 30 years). The book we’ve been working on takes the cultural standards she’s preserved and narrows the focus to her own family’s favourites. Well, narrowing the focus, is a deceptive term here. The book will have over 300 recipes. Noorbanu’s been cooking for her family for over 60 years. She had to narrow down to only 300 or so favourites. It’s unusual for someone to dedicate their life to preserving family and cultural recipes in this way. I can hardly believe that I’ve spent this much time working with Noorbanu on this book. Self-publishing on this scale is an enormous task – creatively, emotionally and financially. Fortunately, it is also a rewarding investment on many levels. The good news is that there are many ways you can preserve your family’s recipes. What follows are some ideas – big and small – for your consideration. If you dream of publishing a cookbook, then you should read this article on The Making of the Toronto Star Cookbook by (part-time) Albertan Jennifer Bain. Bain points out in her piece that publishing houses want to publish books for authors with a wide audience already. If you own a restaurant, have a successful blog or are a revered writer with a huge following, you might get such a deal. Publishers want a sure thing. My mentor has always self-published. When she started in the 1980s, she took a stack of type-written recipes to a printer – they hired a photographer and took photos of some of the food – and the whole thing cost $2/book to produce. The printer was flexible and allowed Noorbanu to sell some books to finance further printings. That book sold for about $10. If you are going to self-publish on a large scale you’ll need to figure out your financing as a print run may cost $50,000, photography $20,000 and layout and design another $15 – 20,000. You’ll also need help distributing your masterpiece and you’ll need to budget money for editing and recipe testing. Self-publishing takes a strong mind – and wallet. For A Spicy Touch – Family Favourites from Noorbanu Nimji’s Kitchen we hired the very capable and creative services of Calgary’s Platform Design. Still, you don’t have to be so lofty in your dreams. There are other ways to hold a book of your family’s treasured recipes in your hands. Friends of mine, Mark and Irene Teare, cherish the photo book that Mark’s sister Alex made for the family. It is her collection of their late mother’s best recipes. The book is deeply personal and it captures the essence of their dear mother Penny who loved to cook for her family and entertain friends frequently. Cooking and their mother equal joy. This simple photo book, with Alex (who is a professional cook) writing her memories and notes about family meals and gatherings is an instant connection to the warmth of their Mother. This kind of project can easily be laid out with iPhoto iBook if you have it. There are many photo book options and you can produce this kind of book yourself inexpensively and make copies to share at Christmas, family reunions or for your children’s graduation from college or when they finally take the leap from your comfy nest. From a different point of view, instead of the children of the family being the ones to preserve family recipes, why not as a parent yourself, put together your collection of favourites and share them with your children? My friends Mother left him and his sister with recipe boxes that contained her repertoire. She even wrapped each recipe card in protective plastic. With Heritage you can order as little as 4 books. Videotaping is a wonderful way to preserve a recipe. I love this video of my Mother rolling out pie dough. There are some techniques that are devilishly hard to explain in words but that jump out at you on video. The video also captures a conversation between a mother and daughter, a shared sense of humour, some of the tips and the voice of a more experienced cook at your side. That’s priceless stuff and while it’s tricky stuff to capture in writing, it seems to roll out of people – just like pie dough – when you get them relaxed and talking. If you own an iPhone/Smartphone you can easily videotape. You’ll find a number of apps to help you with the editing process on iTunes as well. I cheat a bit when it comes to editing and get my 16 year old son to help me! If you’ve become the family video producer, you can produce a DVD, print your own covers and share it at a special occasion with your other family members. Starting a blog to save your families recipes is a great idea. You can get a blog site for free (but do upgrade so you can avoid unsolicited ads). WordPress is – I think – the most powerful blogging platform. Some of my friends blog on Tumblr or Blogger but I don’t find those sites as easy to share from. I spent a wonderfully warm afternoon with Alberta at Noon host Donna McElligott and her Mother, Mrs. Sheila McElligott, capturing the McElligot family’s Irish Soda Bread recipe for my on-going passion for preserving heritage recipes. The experience was rewarding in a number of ways. Donna and I got to practice new skills with a great mentor. The food and tea party we enjoyed at the end put us in a bonus situation. Donna can more easily share this great recipe with her own daughter. The recipe is preserved for another generation in the family to enjoy. Perhaps the most poignant and powerful part of it all is that Mrs. McElligot enjoyed someone being interested in her knowledge and wisdom. Recognizing an elder for their contributions is reason enough for me to keep doing this. There are lots of ideas on Pinterest. Pinterest is the modern day scrapbooker’s paradise. You can find cute ways to create beautiful scrapbooks of your family recipes. One person “pinned” a collection of old recipe cards gathered into a collage and framed beautifully to decorate a kitchen wall. Talk about an instant touchstone to the previous cook’s in your family. That must bring a smile of warm memories every time they walk past it. You can also have a treasured family recipe engraved on cutting boards or printed on t-shirts for a family reunion. Pinterest should come with a warning though – the average person, once they’ve entered Pinterest – spends 90 minutes on the site! When all else fails, you can always turn to Martha Stewart for ideas. Crafts make my eye twitch. I am not a “crafter” but I recognize that for anything even remotely crafty – Martha Stewart will present ideas with panache. Here’s a look at some very pretty ideas from Martha. I look forward to hearing about what other ideas the Alberta at Noon listeners have. I’m sure there will be some great ones. 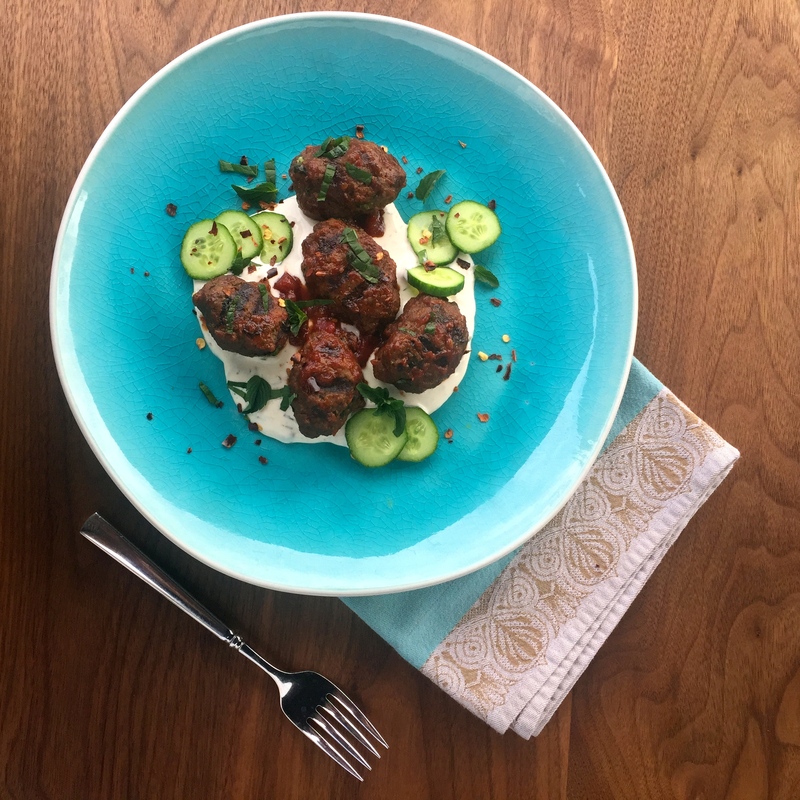 Until then, here is a great summery recipe from me and my beloved mentor Noorbanu Nimji and our forthcoming book – A Spicy Touch – Family Favourites from Noorbanu Nimji’s Kitchen – coming to a bookseller near you this fall. 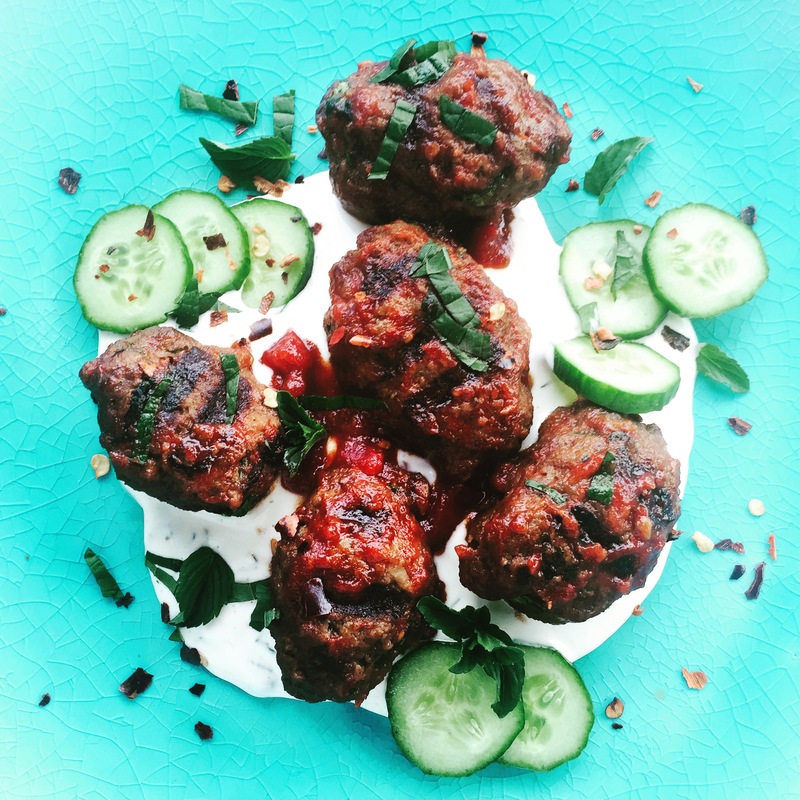 I’m not sure how many centuries a recipe like this one for Beef Shish Kebabs would have been handed down but I am sure of one thing, family recipes are great cultural touchstones for people the world over and if we lose wonderful old family recipes we lose a bit of ourselves too. Maybe NOW is the time to preserve your family’s favourite recipes? It will surely help future generations savour it all. Put all the ingredients in a bowl and mix together with your hands until the ingredients are well distributed. Thread one ball onto a skewer and shape the meat mixture into a thumb length kebab around the skewer. Repeat until there are 4 or 5 on each skewer. Place the skewer on a hot grill and cook about 4 minutes each side, or until thoroughly cooked and juices run clear. Tip: I like to make hamburger patties with this meat mixture, call them “Shish Ka-burgers” and eat this ancient food in that contemporary way. Squeeze any water from the cucumber after grating it and then stir it into a bowl with the yogurt, cumin, pepper, chilli and mint. Garnish with the coriander leaves. I don’t know about dump cakes, but I did write about mug cakes in my May column for Alberta at Noon. I think the audience you are writing Cooking without Mom for would love these little cakes they can make in single portions in the microwave in less than a minute. My family sure did. Thanks for your kind words and ongoing support.